Computer science is the study of information and computation. The Math Department offers a minor in computer science focused on the central principles of problem solving and algorithms as they are applied to diverse fields such as bioinformatics, artificial intelligence, databases, security and computational mathematics. Courses in computer science will provide valuable programming experience relevant to many scientific endeavors, and the minor can be individually tailored to complement majors such as mathematics, biology, neuroscience, business, and economics. A minor in computer science consists of 5 courses in computer science and mathematics coursework. All computer science minors are required to take CSC 207 and CSC 234 and at least once course from CSC 310, CSC 440 or CSC 450. The remaining courses must be selected from the following: MATH 220, CSC 277, MATH 310, CSC 310, CSC 440, CSC450, CSC 400 (at least 4 credit hours), and MATH 405. It is recommended that students planning to minor in computer science take the introduction course CSC 207 in either the first or second year of their coursework. 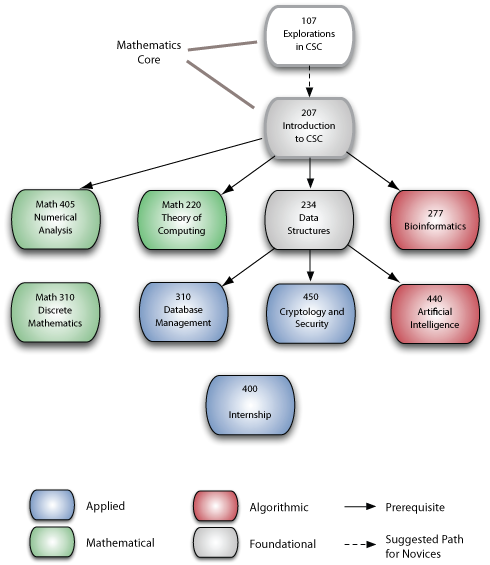 Those students interested in a computer science minor but with limited mathematical background are encouraged to first take CSC 107. View a flowchart of the requirements.